The Balsham Plough Monday Club consists of a group of men who live in, or are connected, to the village of Balsham in Cambridgeshire. 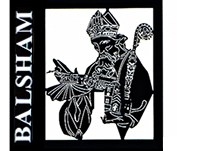 They raise money annually on Plough Monday and bi-annually at the Balsham Feast for charities in and around Balsham. Plough Monday itself is a very ancient custom whose earliest history lies in the 16th century although it may well have roots originating from religion well before then. Documents tell of a “plough candle” being lit in churches during January in the 13th century. Plough Monday is traditionally the first Monday after Epiphany (January 6th or “twelfth night” as it is also known). Its celebration seems to have covered much of the Eastern half of the country, particularly in small rural villages. Earlier times in Balsham Plough Monday marked the beginning of the winter ploughing season when the farm workers returned to work from their short but unpaid Christmas holiday (or lay off). For these men who had no money, it was an ideal opportunity to collect both food and money. They would call on the village squire, farmers, shopkeepers and their “better off” fellow villagers, in fact anywhere they could reasonably expect a donation. If they were refused anything, as would sometimes happen, they would threaten to plough a furrow across their nice neat lawn. The revival of the tradition came about when a few villagers got talking as to how to raise funds for the village, particularly for the Church Tower Fund. The outcome of this conversation was that on January 10th 1972 the newly refurbished wooden plough was brought out from Lower Farm, with 6 men acting as the horses and an assorted group dressed in smocks and string tied breeches, plus the top hatted squire and his Betsy (a man dressed as a woman), they toured the village calling at as many houses as possible collecting as they went. A grand sum of £75.00 was raised that year. Over the past 40 years an amount of just over £48,000 has been raised by the Balsham Ploughmen.